In case you hadn't heard, the new series of Game Of Thrones is hitting our screens on April 25th, woohoo! We thought we'd launch a competition to celebrate, so we've teamed up with In My Heart Designs to bring you this awesome prize! 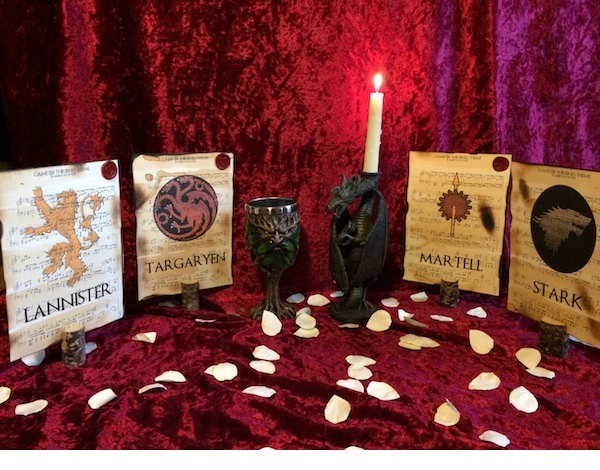 Direct your guests to their tables with Eight Game Of Thrones Themed Wedding Table Name Cards from In My Heart Designs. Each card bears the name and sigil of one of the houses featured in GoT. There are 30 to choose from! Behind the house name and sigil you will find the sheet music for the GoT theme tune. The double sided cards are stained and scorched to give them an authentic look. The cards can come with or without the artist's logo stamped in red wax in the corner. So if you're planning your wedding and you're a GoT fan, you'd be a fool not to enter via the form below! In My Heart Designs produce unique one of a kind art work, whether that is a painting, sheet music art, or cards. Every piece is hand finished to make each one personal and unique to you! Custom requests are very welcome, so please ask. "A wedding is an incredibly personal thing, and our aim is to help provide that personal and unique feeling with our products." Competion closes at midnight on 1st May 2016. One winner will be selected at random and notified via email shortly after the closing date.